How does a hero live on? What makes a good dad? These are the thematic questions that the Wapahani High School Music, Art, and Drama Departments’ fall musical.Big Fish, book written by John August and music and lyrics by Andrew Lippa and based on the novel by Daniel Wallace and the Columbia motion picture written by John August and produced by special arrangement with Theatrical Rights Worldwide, is centered around. These questions challenge Edward Bloom, played by senior Matt Stellwag, and his son Will, played by junior Nathan Brant. In Act I, when Will discovers that he is going to become a dad himself, he realizes that he doesn’t really know his own father. Edward, a traveling salesman, was never home and has always told wild, adventurous stories about himself and the people he has met in his life, but Will doesn’t know which stories are true and what they really say about his father. Act I is told in a combination of present day scenes and dramatizations of Edward’s unbelievable tales, including how he met his wife Sandra, played by eighth grader Syndal Hittson, and his best friend Karl the Giant, played by junior Seth New, and his quest to find Sandra when he loses her. When Edward learns that he is ill, he uses his stories about a circus, a werewolf, and a mermaid, among others, to escape reality. sophomore Joselyn Hittson, must face Edward’s inevitable death, supposedly described to teenage Edward by a witch, played by senior Maya Wilkinson. Big Fish reaches its climax when Will accuses his father of cheating on his mother but ultimately learns the inspiring truth about the man he calls dad. The directors, choir and band teacher Mr. Kevin Van Note and Drama Club sponsor/English teacher Mr. Ken Robinson, were drawn to Big Fish by the music. Robinson has said that the music more than in any other musical they have directed is an integral part of the storyline. Songs such as “Be the Hero,” “I Know What You Want,” “Stranger,” “Daffodils,” “Fight the Dragons,” “Two Men in My Life,” and “I Don’t Need a Roof” are full of emotion and are key to understanding the main characters. 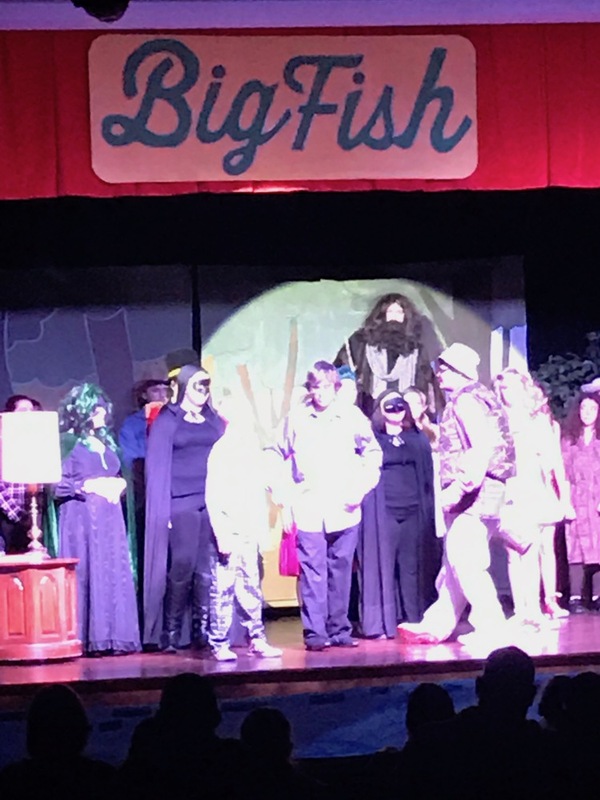 With a cast of 38 students ranging from sixth grade to twelfth, Big Fish is a true collaboration between Wapahani High School and Selma Middle School. Mr. Van Note and Mr. Robinson are extremely proud of the hard work and long hours the cast and crew have put in over the last nine weeks leading up to the production on Thursday, November 17; Friday, November 18; and Saturday, November 19. They would like to thank the Wapahani Music Boosters for their support and the community for supporting theatre arts in Liberty Perry Schools.